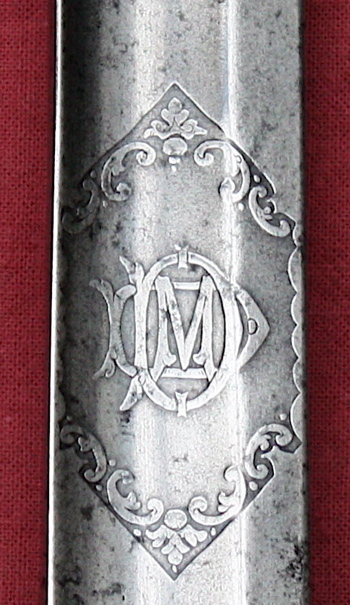 A Troopers version of the British 1821 Pattern Light Cavalry Sabre stamped on the blade, guard and scabbard Osborn. I'm hoping this triple stamping indicates that the sword is complete as issued rather than a later match up. The blade is 35 1/2 inches long and just short of 7/16 of an inch at the ricasso. It has been sharpened for 25 inches from the tip plus 4 inches of the back edge sharpened as well. I have photographed it beside a British 1821 Pattern Wilkinson Heavy Cavalry Undress Sabre from the 1870's and as you can see the L.C. 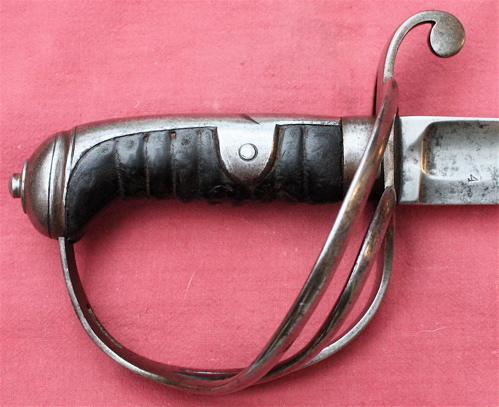 Sabre, which I think was made prior to the 1840's, is perhaps surprisingly a bit more substantial. Many thanks in advance for any and all info and replies. P.S. I would like to thank Mr. J. Hopkins for previously supplying me with some helpful info pertaining to this particular L.C. model. Congratulations on a great new sword! A lot of these are in rough condition and yours is quite nicely preserved. Troopers' swords tend to be beefier than officers' swords. Perhaps this is due to the fact that they were issued weapons (and government property) and had to survive a bit more abuse than an officer might inflict on his sword, as well as pass through many more hands in its working life. As you may already know, some regiments in the Light Brigade carried this pattern in their famous charge at Balaclava (others were armed with the new P1853). That reminds me I still need to consult Robson for that additional information on production numbers and dates! PS--Have you posted that P1821 HC officers sword before? Robson has a lot to say about this pattern, so I will summarize as best I can. The first record of this pattern is found in correspondence between the Adjutant-General's office and the Board of Ordinance (10 December 1821) calling for 296 swords "of the new pattern" to be issued to the 4th Light Dragoons. The blade followed the same principle of construction as the P1821 heavy cavalry trooper's sword, but with a three bar guard. 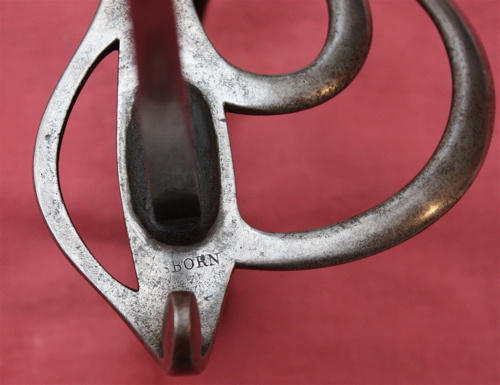 The pattern marked the beginning of a long line of cut-and-thrust swords in the British cavalry (and indeed the infantry, artillery, etc.) which lasted throughout the 1800s. With plenty of P1796 LC swords for the yeomany, production of the P1821 LC began in March of 1823, with 6,000 being produced by 1825. By 1827 complaints were made about the sword and scabbard being too light and constantly breaking or having to be repaired. A committee was formed in 1828 to address these concerns but its recommendations were not fully implemented. The modifications appear to be confined to increasing the weight of the blade and scabbard by a few ounces. 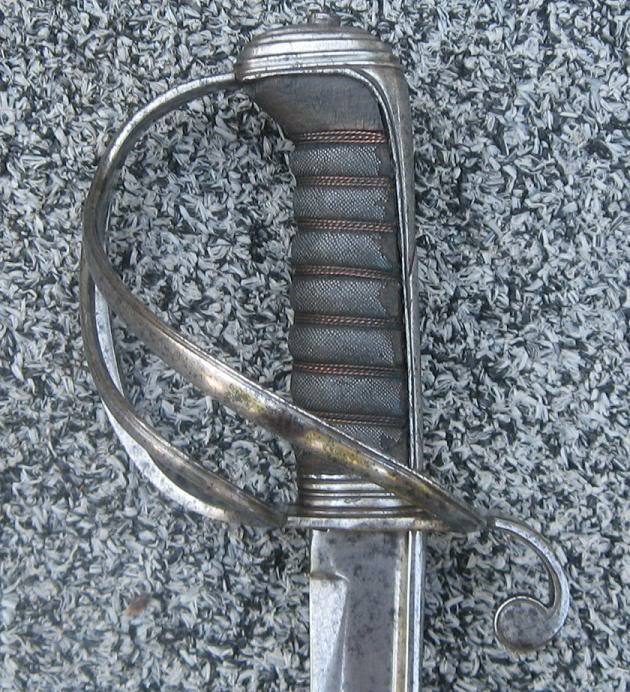 The issue came up again in 1833 when a new sword design was submitted by a young cavalry officer (Lt. W. Miller, 8th Hussars). RSAF Enfield did not find the design to be an improvement but did use its submission as an opportunity to revisit the findings of the 1828 committee. The proposal to enact any of the recommendations was rejected as large stores of the P1821 had already been produced. In 1835 a further order for 1,000 HC swords brought the 1828 findings to light once again, and Enfield called for reports from all regiments which had received either 1821 pattern. The regiments had little criticism of the swords themselves, but rather the quality of manufacture, and a nearly unanimous opinion that the scabbards were too weak. Enfield felt that 3 criticisms were valid: that the LC guard was too constricted, the fullers were too deep, and the scabbards too weak. Enfield modified a number of P1821 LCs to address the concerns. These were sent to regiments for comment. 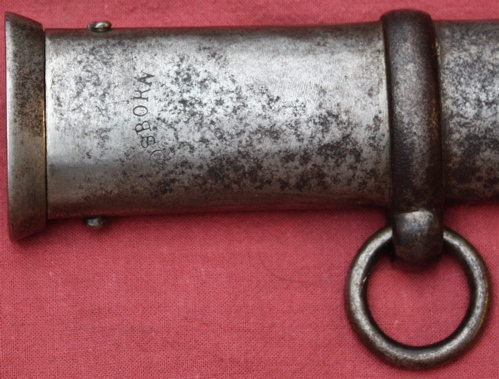 The modifications to the LC sword included a larger pommel and extended bars for more room for the hand, as well as new heavier gauge steel scabbards. 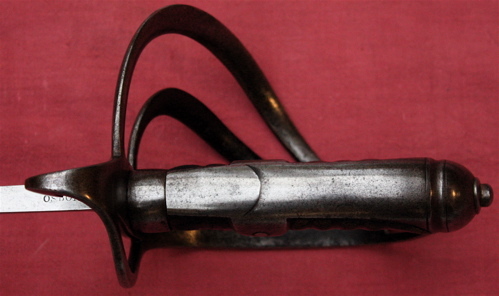 The new hilt was not unanimously liked, and some felt the scabbard should be made of wrought iron because it was thought to be easier and cheaper to repair. In spite of this, no other changes were made to the pattern until it was superseded in 1853 by the new universal pattern. Hopefully that helps a bit! If not, I recommend getting a hold of Robson's Swords of the British Army through your local library. First of all many thanks for your time and information, it has made for very interesting reading. I'm surprised that it was felt these swords were somehow inadequate as the one I have appears to be very substantial and well enough made, I wonder if various cutlers interpreted the specifications differently or as nowadays the quality of steel varied quite a bit from maker to maker. 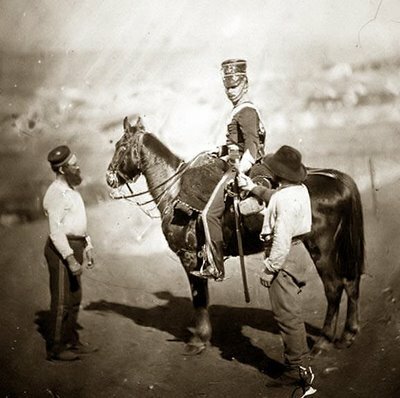 I have attached a photo, I think I'm correct, of a Light Cavalry Trooper within the correct time period with one of these swords at his side. I really like the blade on your Officer's sword the 'pipe back' reminds me of the 'yelman' found on Indo Persian, Caucasian and Persian blades the purpose of which is to increase the cutting ability of the blade at the point which includes the CoP, see attached photo of an Indo Persian sword of mine which has this feature. You are correct in that I did ask on the SFI Forum a question regarding an Officers H.C. sword of mine and you did indeed help with this. The record for this sword only has dates and unfortunately no names, the previous owner whom I eventually was able to contact had already researched to this point, I didn't know this at the time of posting on SFI. This still leaves the question of the sword's ownership, see photo with initials on blade, would be nice to find out more. Thanks again for your help. I am glad to be able to help. That is a great photo! I love these period photos of soldiers with their weapons. The yelman on my officer's P1821 is the nicest I have seen on this pattern and is much more Eastern in inspiration than others. Thank you for posting your example. I will see what I can do about helping you identify the owner of your sword. The monogram is extremely helpful. Major Du Boulay served in the Egyptian war of 1882 in command of the Signallers of the Cavalry Division, and was present in the engagements at El Magfar and Mahsama, in the two actions at Kassasin, and at the battle of Tel-el-Kebir and the capture of Cairo (Medal with Clasp, and Khedive's Star). Googling his entire name in quotes will bring up information pertaining to his regimental assignments and promotions. I also suggest searching www.gazettes-online.co.uk for additional information. What date was the sword purchased? If it was on or around his date of his commission as 2nd lt. than that would solidify this tentative ID. Admittedly this could be a stretch based on how etchers decpicted complex names like Du Boulay's, but he seems to be the only choice. I bought a 1821 pattern a few years ago. Your website has been a revelation and I have read with great interest all your comments. I wonder if anyone can give me some insight into my sword. The blade has a stamp bearing the makers name, E Wood of Bow Street, London. I have tried to attach photos but from some reason I have not been able to do so. Any information on my sword would be greatly appreciated.